We typically characterize vultures as gluttonous creatures, obligate scavenging birds of prey that engage in rough-and tumble feeding frenzies at large ungulate and pachyderm carcasses in the company of dozens of other “all consuming” vultures, scarfing up enough meat to last for several days. And indeed, vultures sometimes eat so much food that they remain grounded for an hour or more after feeding for partial digestion to take place, before they are light enough to take off. Having watched these birds feed for many years, I can tell you that all of this is true. But watching vultures at so-called “vulture restaurants,” where humans routinely provide food, sheds light on an aspect of vulture feeding that goes largely unrecognized by the general public. The vulture restaurant at the Hoedspruit Endangered Species Centre in northeastern South Africa after dinner is served. Note the Marabou Storks in the foreground and the ling-necked African White-backed Vultures in the background. Hoodies are nowhere to be seen in the initial scrum. In fact, some vultures are “finicky” as well as “voracious,” feeders; especially at vulture restaurants where daily meals are typical. The world’s first vulture restaurant, in the Drakensburg Mountains of South Africa opened in the 1960s to help supplement the diets of local Bearded Vultures. Today, vultures restaurants (bird feeders for vultures, if you will) are used to provide “clean,” lead-free meat to recently released California Condors in the American West. Many of the restaurants are associated with ecotourism, serving a useful purpose in bringing vultures and people together. One such restaurant at the Hoedspruit Endangered Species Centre near Kruger National Park in northeastern South Africa has been feeding wild vultures and other scavenging birds for more than 30 years. The restaurant works well at attracting handfuls of Pied Crows and Black Kites, dozens of Marabou Storks and Hooded Vultures, and hundreds of African White-backed Vultures, the latter two of which are now Critically Endangered. Earlier this month, University of KwaZulu-Natal post-doctoral student and Hawk Mountain research associate, Dr. Lindy Thompson, and I spent four days at the Centre near Hoedspruit trying to catch Hooded Vultures. During that time we learned a lot about the finicky feeding behavior of the birds. Our goal was simple enough: catch as many as three of the Hooded Vultures visiting the restaurant, and fit them with satellite-tracking devices that would allow us to monitor the movement ecology of the species, including information on how dependent individuals were on vulture restaurants in the region versus how much time they spent in the nearby Kruger National Park feeding on native wildlife, and how they interacted with other species in the region. Dr. Lindy Thompson, releasing “Don King” after his capture in February. Note his downy top-knot and relatively thin bill. We already had caught and fitted 10 Hooded Vultures with tracking devices in South Africa, and two of our previously tagged birds actually showed up at the restaurant during our four days of observation, even though neither has been tagged there. One of the two, Don King, had been caught at a private nature reserve 45 miles north of the Hoedspruit restaurant in February of 2016. Don looked healthy enough, although he had lost his downy top-knot that led to its name. The second tagged bird, Mopane, had been caught in Kruger National Park about 60 miles northeast of the restaurant in August of 2014. It, too, looked quite healthy. The two marked birds were joined by about 30 unmarked individuals that visited the restaurant daily. Unfortunately we were unable to capture any of them. We did snare several of the far larger African White-backed Vultures that clearly dominated the smaller “hoodies” at the restaurant’s offerings. Hooded Vultures, it turns out, are finicky feeders when feeding in the company of White-backed Vultures, pecking at and gleaning only tiny scraps of meat with their small, thin bills, after the meat had been torn apart by the larger white backs during feeding frenzies. By the time the hoodies got close enough to our traps, the snares we had set already had been pulled closed by the white-backs, making capturing the former all-but-impossible. Lindy Thompson and Andre Botha of the South African Endangered Wildlife Trust will try to capture the hoodies at other feeding sites that attract fewer white backs. Older elephant carcasses work well for this purpose, as they often continue to be visited by the more fastidious hoodies for several days after larger vultures, hyenas, and jackals have stripped most of the flesh from carcass. The finicky feeding behavior of hoodies is well known among those of us that study the birds. It appears that hoodies have instituted their own specialized feeding niche, one that involves “cleaning up” after the larger and less finicky species. Although this makes hoodies a bit more difficult to capture, it is somewhat endearing as well. As I see it, a vulture that cleans up after other vultures can’t help but be appreciated. As readers of this blog know all too well, Africa’s vultures are in trouble … big trouble. Nine of 11 species are “Red Listed” by the International Union for the Conservation of Nature, either as Near Threatened, Vulnerable, Endangered, or Critically Endangered, and many regional populations face the immediate threat of extirpation. Hooded Vultures, whose movement ecology Hawk Mountain decided to study in detail in 2012 are no exception (the species is now considered Endangered globally), and many populations in both East Africa and South Africa appear to be in steep decline. With critical support from the Wallace Research Foundation and North Star Science and Technology, Hawk Mountain and its colleagues in Africa are in the process of placing satellite tracking devices on individual Hooded Vultures in many parts of its African range. Indeed, if all goes according to plan, two or more tracking devices will be placed on Hooded Vultures in Ethiopia, Kenya and South Africa later this autumn. Earlier this week my colleagues and I placed four units on Hooded Vultures (three juveniles and one adult) in The Gambia, a small West African nation surrounded on all sides except for its Atlantic Coast by Senegal. The work went extremely well and what I learned during my short visit to this African nation has lifted my spirits considerably. Clive Barlow, an intrepid Gambian colleague and new friend, has been watching Hooded Vultures for decades in The Gambia, and his willingness to partner with Hawk Mountain allowed me and raptor specialists Dr. Marc Bechard of Boise State University and Dr. Corinne Kendall of Columbia University to conduct a series of road surveys in The Gambia, as well as catch and tag four individuals for satellite tracking. Clive who has worked in The Gambia as an ornithologist for 30 years, co-wrote the book on Gambian birds with Dr. Tim Wacher ZSL UK (Barlow, et al. 1997. A field guide to Birds of The Gambia and Senegal), and l laid the ground work perfectly. Our first day on the ground included meeting our counterparts inthe Gambia Department of Parks and Wildlife Management, including its director Mr. Momodou L. Kassama, and explaining how we intended to proceed with our work and discussing the details of our permit. The second day included baiting a trap site that Clive had been “pre-baiting” for weeks and sitting back and waiting for the vultures to arrive. Part of a large communal ground roost used by Hooded Vultures near the national airport in The Gambia. We placed the bait–a recently killed domestic chicken–out and set the trap at 9:30 a.m. Within two hours our first birds (two adults and a juvenile) dropped down and within a minute, we had trapped our first two Hooded Vultures: an adult we named Makasutu after the privately protected forest we had caught it in, and a juvenile named Mandina-Gambia, after the Mandina Lodge, the ecotourist facilty we used as base camp. In addition to placing tracking units on the birds, we collected a small amount of blood from each of them for sexing and eventual genetic analysis, weighed them, and released them back into the wild in short order. It is unusual to trap two birds simultaneously so we were confident about our great start. The next day we caught and tagged another juvenile in the Department of Parks and Wildlife Management’s Abuko Nature Reserve about 20 kilometers away, and named it Abuko in honor of the reserve. We also conducted the first of three roadside counts along a 24-kilometer route during which we saw an astounding (at least to us) 654 Hooded Vultures. 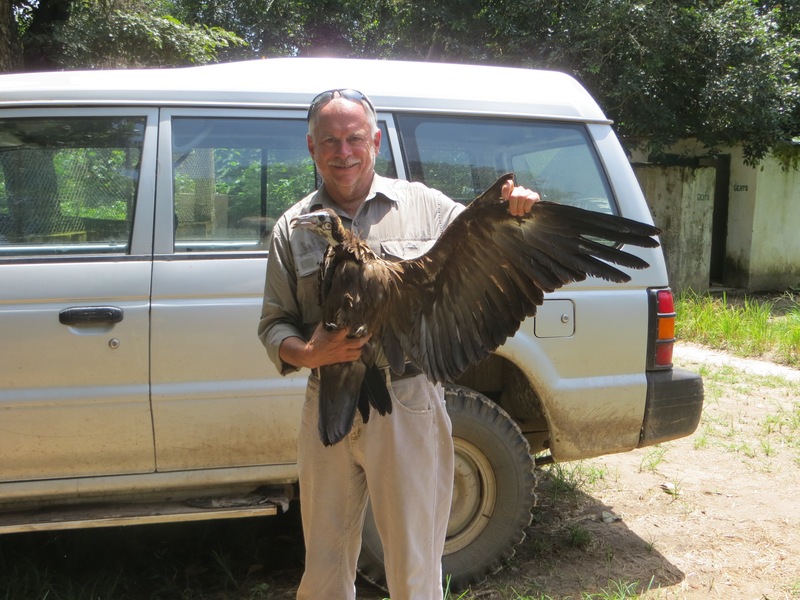 Two days later we caught a second juvenile at Abuko and named it Tan Hoodie … “Tan” meaning “vulture” in the local Wolof language. Two additional road surveys later in the week suggested that in western-most Gambia, at least, populations of approximately 20 birds per square kilometer were the norm, which is far more than any of us had anticipated. Indeed by comparison, I had only a few dozen hoodies during five weeks of work in the Masai Mara region of southern Kenya in 2011 and 2012.Why the birds are doing so well in The Gambia remains something of a mystery, but studying the movements of these birds, and comparing them with those of birds in decline populations elsewhere promises to be an important first step in understanding the species ecology in different parts of it range, which, in turn, should help us better assess where the threats to this species lay, and how we might better design effective strategies for their survival. 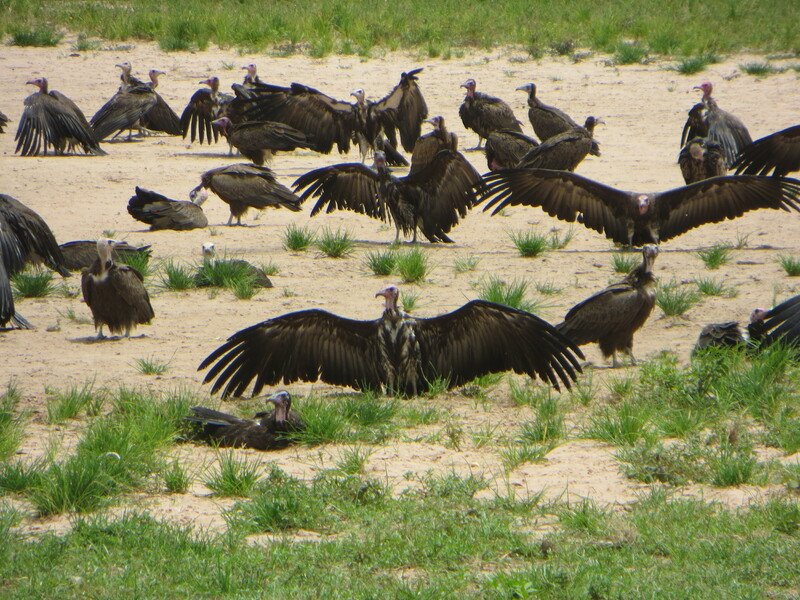 Several adult Hooded Vultures at a trapping site. Unfortunately, one week in the Gambia is but a tiny step in the right direction. Additional work, including satellite tagging many more birds is needed. The task will not be easy but for the rationale for doing it is plain. If we don’t learn more about this species ecology and behavior, and we don’t learn it quickly, we may lose ecologically functional populations of this the most widespread of all African vultures.More field work will require more funding, of course. 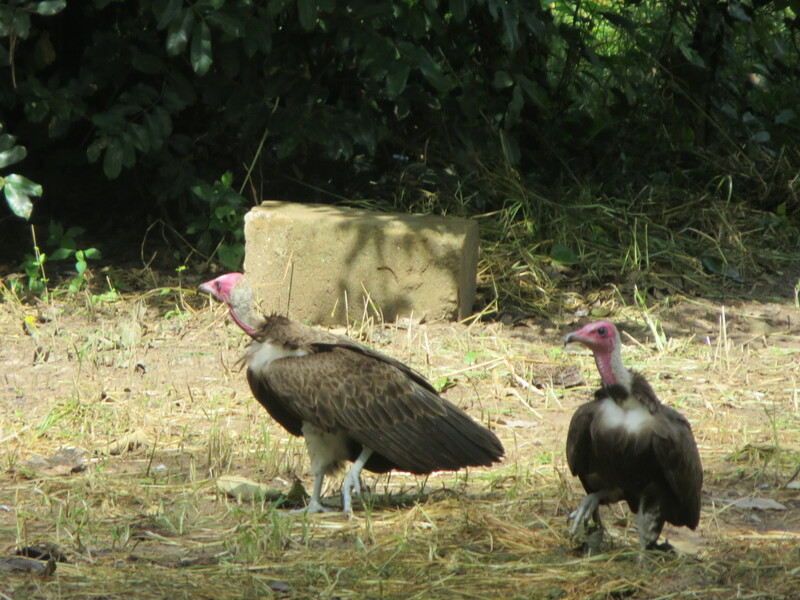 But my trip to a haven for Hooded Vultures has only served to rejuvenate my enthusiasm for this important project. The loss of ecologically significant populations of vultures in southern Asia has brought with it dramatic increases in scavenging feral dogs, which, in turn, has resulted in rabies in humans skyrocketing in many places. We simply can’t afford to let that happen in Africa, the center of Old World Vulture diversity.Hawk Mountain plans to be in this good fight for the duration. If you want to help Hawk Mountain in this truly worthwhile effort, please contact me. For information about how you can help, contact: mailto://bildstein@hawkmtn.orgor 570-943-3411 x108.